Valued for its foliage as well as its flowers, lavender has been cultivated as a garden ornamental for centuries but it’s probably never been more fashionable than now. Interest in the genus continues growing. There are as many as 32 species of lavender plus numerous hybrids and cultivars and tempting new varieties arrive in the nurseries every summer. 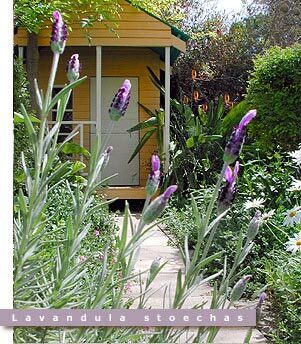 Growth habits of the various lavenders differ widely and create different patterns and textures in a garden design. These can only be judged in mature plantings, not from young nursery plants in pots or black bags. You may want the quiet velvety mounds of French lavender types (L dentata), the richly coloured flowers of the Spanish lavender (L stoechas) or the Ebullient growth of the ‘Margaret Roberts’ lavender (L intermedia). For many gardeners the Latin names of plants may seem an unnecessary complication but in fact they are usually the only way to be sure of getting exactly the plant you want. They’re worth mastering because once you understand how the botanical system of family, genus, species, hybrid and cultivated variety (cultivar) it helps you understand how the plants are related and how the differences and similarities of cultivars have evolved. This is especially helpful with the lavenders, where things are even more complicated. Because the genus Lavandula has been cultivated for so long many of the old favourites are actually hybrids and not species, which has led to considerable confusion of names. There are however some registered cultivars on the market where you can be reasonably sure of what you’re getting. But the bottom line is this: If you ask for English, French, Dutch or Spanish lavender, you might not get the one you’re looking for. It’s best to go according to types. Try to make sure that you have the Latin name eg Lavandula dentata or the name of the cultivar which is the one in quotes eg Lavandula stoechas "After Midnight" . If you can’t be sure of the name, don’t buy a lavender bush that’s not in flower.